Time travel has been a common plot device in fiction since the 19th century, and one-way travel into the future is arguably possible given the phenomenon of time dilation based on velocity in the theory of special relativity (exemplified by the twin paradox), as well as gravitational time dilation in the theory of general relativity, it is currently unknown whether the laws of physics would allow backwards time travel. These events, often called time slippages, seem to occur randomly and spontaneously. Those who experience these events are often bewildered and confused by what they see and hear, and afterward are at a complete loss to explain them. And also a few stories from those who claimed that they are the real time travelers. ScotlandIn 1935, Air Marshal Sir Victor Goddard of the British Royal Air Force had a harrowing experience in his Hawker Hart biplane. Goddard was a Wing Commander at the time and while on a flight from Edinburgh, Scotland to his home base in Andover, England, he decided to fly over an abandoned airfield at Drem, not far from Edinburgh. The useless airfield was overgrown with foliage, the hangars were falling apart and cows grazed where planes were once parked. Goddard then continued his flight to Andover, but encountered a bizarre storm. In the high winds of the storm's strange brown-yellow clouds, he lost control of his plane, which began to spiral toward the ground. Narrowly averting a crash, Goddard found that his plane was heading back toward Drem. As he approached the old airfield, the storm suddenly vanished and Goddard's plane was now flying in brilliant sunshine. This time, as he flew over the Drem airfield, it looked completely different. The hangars looked like new. There were four airplanes on the ground: three were familiar biplanes, but painted in an unfamiliar yellow; the fourth was a monoplane, which the RAF had none of in 1935. The mechanics were dressed in blue overalls, which Goddard thought odd since all RAF mechanics dressed in brown overalls. Strange, too, that none of the mechanics seemed to notice him fly over. Leaving the area, he again encountered the storm, but managed to make his way back to Andover. It wasn't until 1939 that the RAF began to paint their planes yellow, enlisted a monoplane of the type that Goddard saw, and the mechanics uniforms were switched to blue. Had Goddard somehow flown four years into the future, then returned to his own time? It’s the short description for the photograph shown at the virtual Bralorne Pioneer Museum, from British Columbia, Canada. A photograph from November 1940 was alleged to show a time traveller. It was claimed that his clothing and sun glasses were modern and not the style worn in 1940. The man with what appears to be very modern sunglasses seems to be wearing a stamped T-shirt with a nice sweater, all the while holding a portable compact camera. Further research proved that the modern appearance of the man may not have been so modern - The style of sunglasses first appeared in the 1920s and in fact Barbara Stanwyck can be seen wearing a similar pair in the film Double Indemnity three years later. On first glance the man is taken by many to be wearing a modern printed T-Shirt but a closer look shows it looks to be a sweater with a sewn on emblem, the kind of clothing regularly worn by sports teams of the period. The remainder of his clothing would also have been available at the time however are far more casual than those worn by the other individuals in the photograph. In October 1969, Matt and his friend Charlie had just finished lunch in the small Southwest American town, and began their drive north along Highway 167 towards the city of Lafayette about a half hour away. It was early in the afternoon. The highway seemed to be practically abandoned with only the occasional car traveling in the opposite direction. Ahead in the distance they saw an old sedan traveling very slowly. They examined the antique vehicle as they got closer. While the style of the auto indicated it to be decades old, it appeared to be in showroom condition, which amazed both passengers. The car was really traveling slowly so Matt decided to put safety first and pass the collector's item. As they did so, Matt noticed a very large bright orange license plate with the year "1940" clearly printed on it. Both men were aghast at this and wondered if this car was headed to a rally or a parade, because it was plainly illegal to operate a motor vehicle with thirty year old license plates. As they passed the car slowly to its left, Charlie, who was in the passenger's seat, noticed the driver of the car was a young woman dressed in what appeared to be 1940 vintage clothing. This was 1969 and the fact that the young woman was wearing a hat complete with a long colored feather and a fur coat was, a bit unusual. A small child stood on the seat next to her, possibly a little girl. The gender of the child was hard to determine as it too wore a heavy coat and cap. The windows of her car were rolled up, a fact which puzzled Charlie, because, though the temperature was nippy, it was quite pleasant and a light sweater was sufficient to keep you comfortable. As they pulled up next to the car, their mild fascination turned to shock as they could clearly see the fear and panic on the woman's face. She was frantically looking back and forth as if lost or in need of help. She appeared on the verge of tears. Being on the passenger's side, Matt called out to her and asked if she needed help. She nodded "yes"! Matt motioned to her to pull over and park on the side of the road. He had to repeat the request several times with hand gestures and mouthing the words because her window was rolled up and it seemed she had difficulty hearing them. They saw her begin to pull over so they continued to pass her and pull off the highway safely in front of her. As they came to a halt on the shoulder of the road, Matt and Charlie turned to look at the old car behind them. It had only been a matter of seconds, but when they looked back for the car, it was gone. Its important to remember that this was on a two lane highway with no turnoffs or high foliage or obstructions that could hide a car. It just vanished. Matt and Charlie just stared at the empty highway. They sat spellbound in their car. They could see for miles behind them and all they saw was an empty road. This is often repeated story, when many variations, but with the same outcome, no proof. In Lima, Peru several years ago a patient came to see Dr. Raul Rios Centeno, an investigator of the unexplained about a serious case of hemiplegia. The patient claimed to be 30 years old but was unable to prove it, stating that she'd lost her formal identification card. It was a very strange case of hemiplegia, since upon examination with a CAT (Computerized Axial Tomography) scan, there were neither areas showing bleeding vessels nor any traumatic lesions. When Dr. Raul began asking questions about the case, the patient told him the following statement: "I was at a campground in the vicinity of the ancient stone forest, Markawasi, when I went out exploring late at night with some friends. Oddly enough, we heard the strains of music and noticed a small torch-lit stone cabin. I was able to see people dancing inside, but upon getting closer I felt a sudden sensation of cold which I paid little attention to, and I stuck my head through an open door. It was then that I saw the occupants were clad in 17th century fashion. I tried to enter the room, but one of my girlfriends pulled me out." The patient was tugged out by one of her friends, and her body became paralyzed in half precisely as she was drawn out of the "stone cabin". His conclusion is that the probable cause behind the hemiplegia is unknown. No medical test was able to ascertain its cause. Nonetheless, an EEG was able to show that the left hemisphere of the brain did not show signs of normal functioning, as well as an abnormal amount of electric waves. Many Peruvians claim having had contact experiences in Markawasi, while many scholars indicate the existence of a dimensional doorway. No conclusive proof of this exists, of course. Others who have visited the stone forest can attest to the existence of a strange kind of energy. According to those persons having knowledge of this subject, dimensional doorways tend to open and close not necessarily in specific places. The patient is currently undergoing physical rehabilitation in Lima's Arzobispo Loayza National Hospital. The unanswered question is, of course, what would have happened if her body had entered completely into the stone cabin? Would she have gone into another dimension? In 1979 two British couples vacationing in the north of France. They were driving, looking for a place to stay for the night. Along the way, they were struck by some signs that seemed to be for a very old-fashioned type of circus. The first building they came to looked like it might be a motel, but some men standing in front of it told the travelers it was "an inn" and that a hotel could be found down the road. Further on, they did find an old-fashioned building marked "hotel." Inside, they discovered, almost everything was made of heavy wood, and there seemed to be no evidence of such modern conveniences as telephones. Their rooms has no locks, but simple wooden latches and the windows had wooden shutters but no glass. In the morning, as they ate breakfast, two gendarmes entered wearing very old-fashioned caped uniforms. After getting what turned out to be very bad directions to Avignon from the gendarmes, the couples paid a bill that came to only 19 francs, and they left. After two weeks in Spain, the couples made a return trip through France and decided to again stay at the interesting if odd but very cheap hotel. This time, however, the hotel could not be found. Certain they were in the exact same spot (they saw the same circus posters), they realized that the old hotel had completely vanished without a trace. Photos taken at the hotel did not develop. And a little research revealed that French gendarmes wore uniforms of that description prior to 1905. The mystery of the John Titor Story has always fascinated many people who have a liking towards science fiction. It all started when a person calling himself John Titor started posting online about time traveling, claiming himself to be a real time traveler. For years, the mystery of this story remains unsolved and it has always fascinated many people reading his story. John Titor is the name used on several bulletin boards during 2000 and 2001 by a poster claiming to be a time traveler from the year 2036. In these posts he made numerous predictions (a number of them vague, some quite specific) about events in the near future, starting with events in 2004. However, as of 2011, these events appear not to have taken place; he described a drastically changed future in which the United States had broken into five smaller regions, the environment and infrastructure had been devastated by a nuclear attack, and most other world powers had been destroyed. For a change, I have a question for all of you. I want you to think…think very hard. What major disaster was expected and prepared for in the last year and a half that never happened? (BTW Someone just gave me a working IBM 5160. Should I save it or toss it?) Toss it. The 5100 is the interesting machine. Titor said the main reason he was posting online was to collect information about 5100 computer and take it back to 2036. This includes, how people react to the fact that Y2K was fixed by a Time Traveler. Also it shows Titor’s stealth skills. How well he performed his duty without being spotted. When asked for technical details about time travel, Titor gives a detailed information of how it is accomplished. To date, the story has been retold on numerous web sites, in a book, and in a play. He has also been discussed occasionally on the radio show Coast to Coast AM. 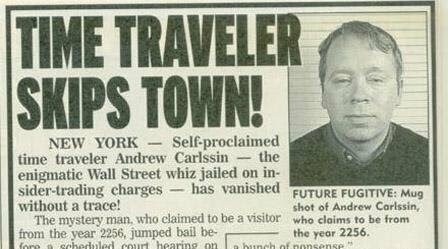 Andrew Carlssin Andrew Carlssin is another person who claimed that he's a time traveler. He was reportedly arrested in January 2002 for SEC violations for making 126 high-risk stock trades and being successful on every one. As reported, Carlssin started with an initial investment of $800 and ended with of over $350,000,000, which drew the attention of the SEC. Later reports suggest that after his arrest, he submitted a four-hour confession wherein he claimed to be a time traveler from 200 years in the future. He offered to tell investigators such things as the whereabouts of Osama bin Laden and the cure for AIDS in return for a lesser punishment and to be allowed to return to his time craft, although he refused to tell investigators the location or workings of his craft. In October 2010, Northern Irish filmmaker George Clarke uploaded a video clip entitled "Chaplins Time Traveler" to YouTube. The clip analyzes bonus material in a DVD of the Charlie Chaplin film The Circus. Included in the DVD are footage from the film's Los Angeles premier at Grauman's Chinese Theatre in 1928. At one point, a woman is seen walking by, talking into a device that Clarke said appeared to be a cell phone. Clarke concluded that the woman was a time traveler.The clip received millions of hits and became an Internet meme. Nicholas Jackson, associate editor for The Atlantic, said the device was either a Siemens or Western Electric brand hearing aid. Philip Skroska, an archivist at the Bernard Becker Medical Library of Washington University in St. Louis, thought that the woman might have been holding a rectangular-shaped ear trumpet. New York Daily News writer Michael Sheridan said the device was probably an early hearing aid, perhaps manufactured by Acousticon. the facts even if there evidence,but i believe there science behind this. 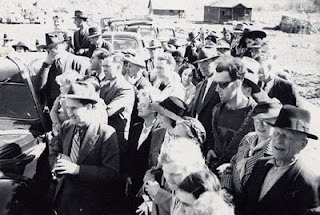 Who is the woman possibly talking to on that cell phone of hers back in 1928, the mothership?